Posted by Pam in KC in Cream & Green Swap Sampler. 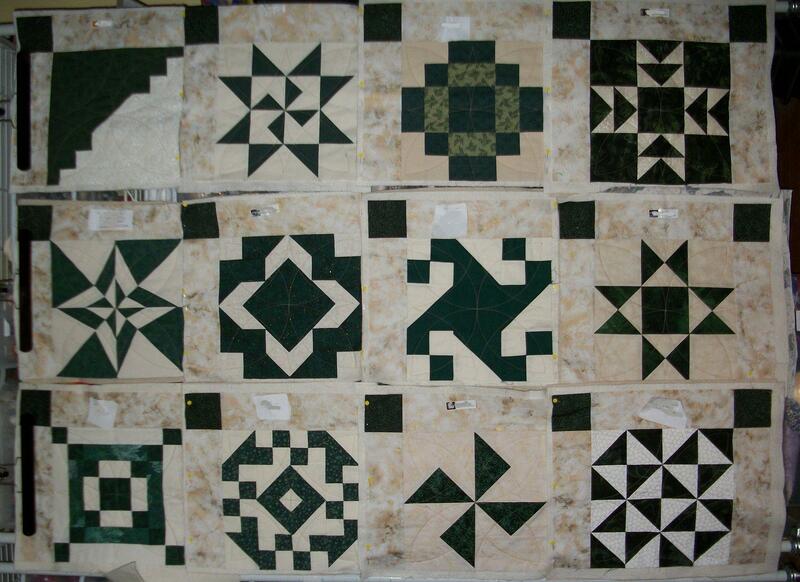 This week I wanted to get 4 of the Cream & Green swap blocks quilted, 2 rows of Blue Ridge Beauty assembled and finish quilting the 5th row of the Double Wedding Ring. Here it is Friday morning and I’ve finish assembling the center of Blue Ridge Beauty (admittedly I need to do a bit of ripping to fix it, but still…) and I’ve done the quilting on not 4 but 7 of the Cream & Green swap blocks (bringing my total to 12 of 20). The good news is that the Cream & Green quilt is on my list for the New Year’s Eve UFO Challenge Finn is hosting, but all this work does mean I’ve been procrastinating on the Double Wedding Ring. But I have figured out what part of the reason is. A couple of days ago I opened up a new package of needles. I’m not sure if it’s the older needles or the newer needles, but my fingers on the left hand are getting beat up this week — which is odd since I’m quilting with a stab stitch. Regardless of my stuck fingers, I need to get on the ball and make some progress this weekend. Check back with me next week to see if I get this 5th row quilted by Wednesday.